Skin is an essential organ. Without Skin, we can’t protect the body from outside bacterial invasion, or have the sense of touch, or control body temperature & have a waterproof barrier. Every individual on this earth is concern about his or her looks & health and wishes to have a healthy-looking Skin without any disease. If you are amongst those who would like to get rid from Skin diseases then this article will definitely assist you a lot. It is better to be aware of Skin disorders and take right Skin diseases treatment before it’s gets too late. What are the Skin problems? Anything that annoys or irritates the Skin can cause symptoms like swelling, redness, and itchy Skin. The other symptoms of Skin conditions include rashes & hives. Few Skin diseases are quick and easy to treat, whereas few are chronic and more difficult to get rid of. Skin diseases differ greatly in severity and symptoms. They can be permanent or temporary, and can be painful or painless. Few Skin diseases are situational causes, whereas others can be genetic. Few Skin conditions are minor, & others can be dangerous. While most Skin issue are minor, others can reveal a more significant issue. Contact your doctor if you think you might have one of these common Skin problems. Temporary Skin diseases, includes contact dermatitis & keratosis pilaris. Few chronic Skin diseases are seen from birth, whereas others appear unexpectedly later in life. Homeopathy is a holistic system, in which diseases are treated by minimal doses of natural substances. It attacks as well as cures the root cause of the disease without any side effects. 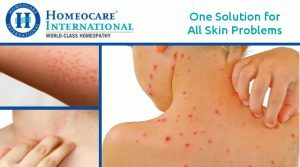 In order to deal with Skin diseases in homeopathy, a complete analysis will be done on the patient mind, genetic factors & the condition of immune system. Homeopathy treatment not only treats the symptoms, but cures the disease from its root cause. Nice Article! Information provided here about all types of skin diseases and about homeopathy is very informative. Homeopathy is the effective treatment for all the skin diseases without side effects. Very informative article! I like the info shared by you. Thanks and keep sharing.